The Loyola experience is rooted in the same Jesuit traditions that have helped shape some of the finest schools in the world. A Loyola student encounters a wide variety of courses, is guided by master teachers, and is challenged and supported every step of the way. Our academic program prepares young men for a life of inquiry, decision making, and learning. Students explore diverse course offerings and come to read more closely, write more clearly, and think more carefully. Whether your son completes our four- or seven-year program, he is the product of our unique formation, which prepares him for college and beyond. Jesuit schools are among the best in the world, and we are proud to serve our region by providing an unrivaled spiritual and educational experience in the Ignatian tradition. Our students achieve academic excellence here as the beginning of a lifelong discipline and pursuit, inseparable from faith and serving others. We call this process “educating the whole person” or Cura Personalis. The Loyola experience is shared by faculty, staff, students, families, alumni, and friends. Whether we are coming together to support our mission, gathering for spiritual celebrations, or working alongside one another to serve the greater good, everyone contributes to the vibrancy and impact of Loyola Blakefield. We tailor every facet of the educational experience (schedule, technology, instruction models, co-curriculars, etc.) to the unique ways in which young men learn and interact. Our recipe for success produces graduates who have all the skills to succeed in college and beyond. We believe in the power and necessity of diversity to achieve a greater richness of ideas and to prepare our Dons to be leaders in an increasingly global community. Our students enjoy a campus that draws from the entire metropolitan region, bringing young men who possess a variety of talents and perspectives. Each blazes his own path as he grows during his time here. We celebrate the engineer-artist, the poet-athlete, the cyber-musician and everything in between. Retreats, service, and brotherhood are central to the experience of every student. More than just a place for academic growth, boys explore their faith, stretch beyond their comfort zones, and set a course toward becoming a servant-leader — a unique Jesuit formation that simply cannot be replicated elsewhere. Originally from the Bronx, John Marinacci attended Fordham Preparatory School, where he was first exposed to the unique characteristics of Jesuit education. He credits the Jesuits and their lay collaborators as exceptional teachers who helped form him in mind, body, and spirit. His experience at Fordham Prep was one of the primary reasons he chose to attend Loyola University, which ultimately led him to continuing his education in Maryland at Johns Hopkins University, as well as becoming more familiar with Baltimore’s rich independent school market. His first teaching position was at Boys’ Latin School, then back to his alma mater for a few years before returning to Baltimore to work at St. Paul’s School as Dean of Students. 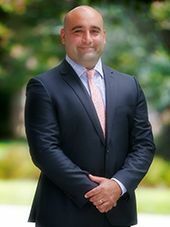 Since joining Loyola Blakefield in 2014, Marinacci has focused much of his efforts on improving the student experience and seeking opportunities to embrace 21st century learning techniques tailored to meeting boys where they are in their social and intellectual development. A perfect example of this was the adoption and implementation of our 1:1 program. Mr. Marinacci holds a Bachelor of Arts degree from Loyola University and a Master of Liberal Arts degree from Johns Hopkins University. John and his wife, Sarah, have a son, Francisco, and two daughters, Ella and Eva. They reside in Towson.